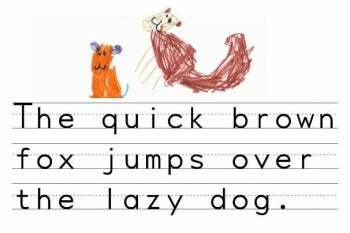 Helping your child with their handwriting skills has never been easier, and now you don't need perfect printing to do it. Penmanship Print, a TrueType font designed by Richard Douglas, provides a plethora of perfectly printed letters on a background of three-line guides. Even if we use keyboards all day, kids still need to learn to write by hand. The glyphs include a complete keyboard, plus a number of special characters such as symbols for pounds sterling, degrees, copyright, and Yen; and the diaeresis/umlaut diacritical mark. Everything a Kindergartener could possibly need! Penmanship Print's ascenders and descenders are shorter than you might expect, but with this font I feel it neatens it up rather than detracts. The kerning is wide, but perfectly spaced, making it easier to use Penmanship Print at smaller sizes: use it at as small as 12 point to label your kid's school stuff, or at larger sizes for writing/reading practice. For me, the guidelines alone are worth the download time; the grave accent key creates an unbroken handwriting guide that you can use in place of a space or without any text to allow you to easily create composition pages to spec. Penmanship Print is free for personal use; for commercial use (or for full embedding) contact Richard Douglas.